By now you've probably read other peoples' laments about Bloglines closing down. It makes me sad because I've depended on it for years, personally and for work. Anyway, the two I looked at were Tiny Tiny RSS (tt-rss) and NetVibes. There are also others like Google Reader, Pageflakes, FriendFeed, but I already knew I wasn't interested in those. One catch with tt-rss is that it's not just an online reader like Bloglines, but software you install and host yourself - or, if you're like me, ask someone else to host for you (word up, Chris). But listen to this: Blake Carver of LIShost.org has created LISfeeds.com to host tt-rss for librarians to use! So if you can't host it yourself but would like to use tt-rss, contact Blake to create an account. Thank you Blake! It looks like Netvibes' online RSS reader is just one portion of what they do. It's all I want though, so I just ignored all the widgety dashboard parts. have to either scroll past a post or manually click to mark things as read? At the moment, I'm leaning towards using Netvibes. Mainly because it's a little bit faster, it lets me email posts (I'll have to work on the link issue though), I can set individual feeds to show either just titles or entire posts, and it seems closest to what I was used to Bloglines. I'm still sad about Bloglines, but I think I could get used to either of these. Oh, but something else: since I've been using Bloglines for 5-6 years, I have hundreds of posts bookmarked in there, which I now what to retrieve somehow. Sigh, change. It looks like Alikewise.com has been around all year, but I only heard about it this weekend - it's a dating website that matches people based on the books they like. This is a great idea for a dating website - it seems a much better way to get at someone's true nature than filling out a profile by guessing what will make you attractive. I checked around the site a bit (without creating a profile), and wonder if there's a way to tie-in with sites like LibraryThing and Good Reads to capitalize on peoples' full libraries. LibraryThing sort of already does this, with their You and None Other meme. But here's something funny: at my first library, we toyed with the idea of a "singles night" book group. We thought it'd be a perfect program for Friday nights, after work, to come and meet other single people interested in books. It never happened, but I always liked the idea. Maybe that'll eventually manifest in Alikewise meetups. And wouldn't this be a heck of a social networking widget to add to a library catalog? "Like this book? Click here to meet other patrons that do, too." I've had ebooks on the brain lately for a few reasons, so I thought I'd pull together some resources I've been bookmarking. The IT Section of the New England Library Association is devoting our spring workshop to ebooks. Speakers will range from libraries already circulating ebooks and ereaders to a certain library that made waves by going digital to a book store that takes digitized books and makes them print again. It will be a great day, and I'll post more details soon. The eBook Buyer's Guide to Privacy from the EFF talks about how each of the most popular ebook readers rate as far as privacy, tracking of purchases, sharing of information, etc. This is worth watching, because low prices means lots of people purchased the hardware, but rising prices means people will be coming to the library for ebooks instead of purchasing the content themselves. A few places where people can download ebooks for free - please list additional resources in the comments. Of course, as soon as I finish typing this post, I'm going to pick up the old-fashion made-of-paper book I'm reading and enjoy flipping through the pages. My library started a new readers advisory program this summer, so I've been updating our reading suggestions webpage. A neat website I just added is bookseer.com. Bookseer is like many "what should I read next" websites, except it is impressively simple. Just type a title and author into their fun interface, and it gives reading suggestions based on Amazon.com and Librarything.com data. Of course, the suggestions will only be as good as the data. But I like that it's building on something already available, and automatically updated, rather than relying on manual edits. And it's simple, free, creative, and doesn't require an account. The second one might not be all that new, but I just learn about it a few weeks ago. 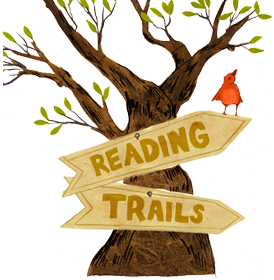 ReadingTrails.com and provides a reading suggestions by linking related books into a chain. Sound odd? I first heard of this form of readers advisory during an RA workshop in the SLIS program at Kent State University. The idea behind it is to identify one theme from the book that the reader likes, then find another book that contains the same theme. Next, pick something from that second book the reader likes and, based on that second criteria, link it to a third book that has that criteria, and on and on and on in a long chain of connected books. An example: for someone who liked the magical aspect of the Narnia books, you might suggest they read Harry Potter. Then, since the Harry Potter series is based in England, you could link it to Neil Gaiman's Neverwhere. Because a book can appear on more than one trail, trails intersect. The result is a network of trails that can be browsed to find unexpected reading pleasures. I checked out the site, and it seemed typical of new and innovative ideas - it's a great idea, and I got some useful information from it, but the site doesn't always work the way I expect. It can be used without signing into an account, which is good. And you can search for books or themes, and from there scroll up and down the "reading trail" of that book to find other reading suggestions. Great. Get the Reading Trails widget and many other great free widgets at Widgetbox! Most of these cons are probably due to the newness of the website, and will likely be improved as the site grows. I don't think I'll use these much on a personal level (unlike LibraryThing), but I will keep both in mind for readers advisory at the reference desk. Last week's Reference Question was about me finding a new source for suggesting good books for patrons - the Mass Book Awards. I'm sure there are tons of others - even my library also has a readers advisory webpage. If I missed one of your favorites, please share it with a comment below.